There’s a lot of tools out there on mindfulness and the benefits of mentally staying in the present moment. I certainly agree with the benefits of staying mentally in the present, but if I’m honest I struggle with staying mentally present. I’m giving myself a graceful hall pass on not staying present right now due to all of the transitions that have gone on in the past month; a big move, job changes, and upcoming travel and even more transitions later this year. I’m trying to be better at present-minded thinking always and this is especially challenging when they’re a lot to mentally and physically process. If you’re anything like me, when you’re at the end of your life you don’t want to get think back and say: “Wow, I had a great time but I didn’t often appreciate the moments while they were actually happening.” To me that would be a life tragically lived; to be given the gift of life and a conscious mind, but not fully and sensorily appreciate the gift of being alive. Over the years through therapy, reading, and interacting with some of the wisest teachers I know on this subject (a long list which ranges from my young nieces and nephews to the Dalai Lama), I’ve done my best to develop some tools for staying in the present moment. They can be remembered by the 3Ms: Movement, Mantra, and Making Notes. A mantra is a collection of words that helps disrupt mind chatter and ground you into the present moment. Some people use verses from sacred texts or phrases that instantly remind them of how they want to feel. 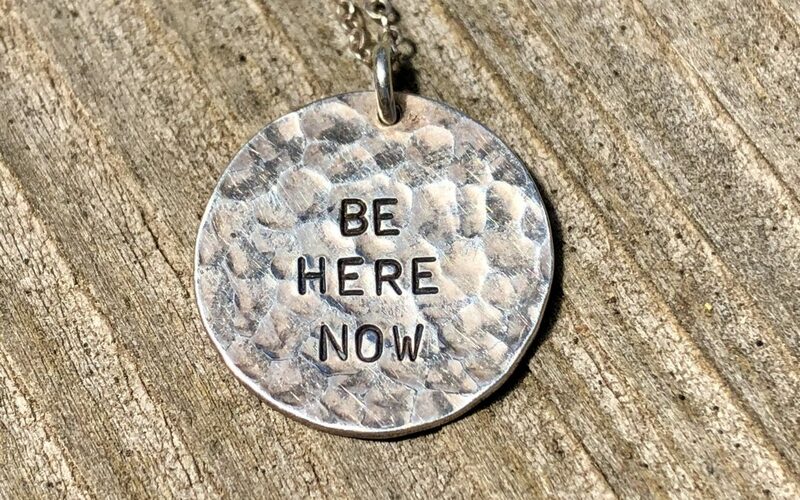 Years ago I had a necklace made on Etsy with one of my favorite mantras: BE HERE NOW. You can see a photo of this necklace as the featured image of this post. I especially love the hammered pattern contrasted with the words of the mantra that are prominently displayed. To me, the hammered pieces are the mind chatter and the BE HERE NOW is a loud and insistent reminder that I ought not to be distracted by the challenges and imperfections of life. Just be in the present right now. The necklace also serves as a feather-light but sensory reminder on my chest that I’m fully within my right to take a full and deep breath. If you can’t think of a mantra, don’t worry. Just let one come to you. You’ll know that it’s your mantra when you hear it or read it and you feel relaxed in your whole body. Or you stop what you’re doing and take a deep breath. Write it down or repeat it again and again forever until you can remember it. Be creative or hire out someone else to be creative for you and put that mantra in your life so you can have access to it early and often to come back to the now. This one has two meanings: make an actual to-do list, and/or make note of what’s around you. Both are powerful tools for staying in the present moment. I don’t think I need to teach you how to make a to-do list, do I? Just in case: write down all of the tasks and reminders that are in your mental chatter bank in a list. Carry that list with you throughout the day or use an app to add to the list as needed. When it’s on a list, you can forget about it. When you’re ready to be productive, pull out that list and start checking things off. Making note of what’s around you is one of the most powerful tools in my anti-anxiety arsenal (anxiety is a close cousin to future-oriented thinking). Start noticing what’s around you. Name it. For example, right now I could say: “There are three framed colored pencil drawings that my grandmother made of pink flowers on dark paper in white frames hanging on the wall in front of me.” State these things out loud if possible. Bring yourself back to what is within your sensory reach right here, right now. Yet another making-note technique that helps me when I’m experiencing uncertainty is making a two-columned list: “What I don’t know” and “What I do know”. Right now I’m trying to sell my car and it’s not happening on my timeline (as if anything ever does!) So on my “What I don’t know” list is the question: “Will my car sell?” on the “What I do know” list is: “I’ve done everything I can to prepare my car for sale; now I need to sit and wait.” Waiting means patience which is a whole other blog post for another day. So many of us future-oriented people are afraid of doing these presented-oriented tasks. “But what if we forget the tasks?” our egos scream at us. This is the part where we have to trust ourselves to remember and that we will remember if the task is important enough. Use a to-do list. We have to ask ourselves why we’re so scared of forgetting things and what we think others will think of us if we drop one or two tasks. Will we be untrustworthy? Unloveable? Or simply human? I think the answer is the last one. What sorts of techniques do you use to bring yourself back into present-oriented thinking? I’d love to learn from you, so leave a comment below. Breathe and believe and BE HERE NOW.